We’re smack in the middle of a busy Hawaii Craftsmen year. 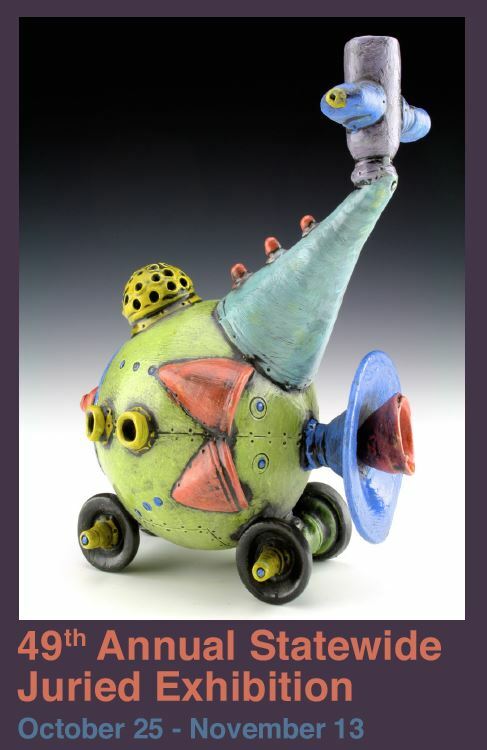 If you haven’t yet, come by The Arts at Marks Garage to see the 40th Annual Raku Exhibit. Its great! Don’t forget we’ll be hosting First Friday at Marks Garage on Friday, July1st featuring Raku artists, firing and wet clay demonstrations. We could use some help and you should come and see the fun anyway! Then in August we host another bi-annual Fiber Hawaii Exhibit—“In Of or About Fiber,” juried by Glen Kaufman. You don’t have to be a fiber artist to enter! You can create art in any media using a strong fiber aspect or motif and you too might be exhibited! Public Lecture by juror Glen Kaufman "Installation"
Join us for a walk-through of the exhibit with our Juror at 5:00 pm. 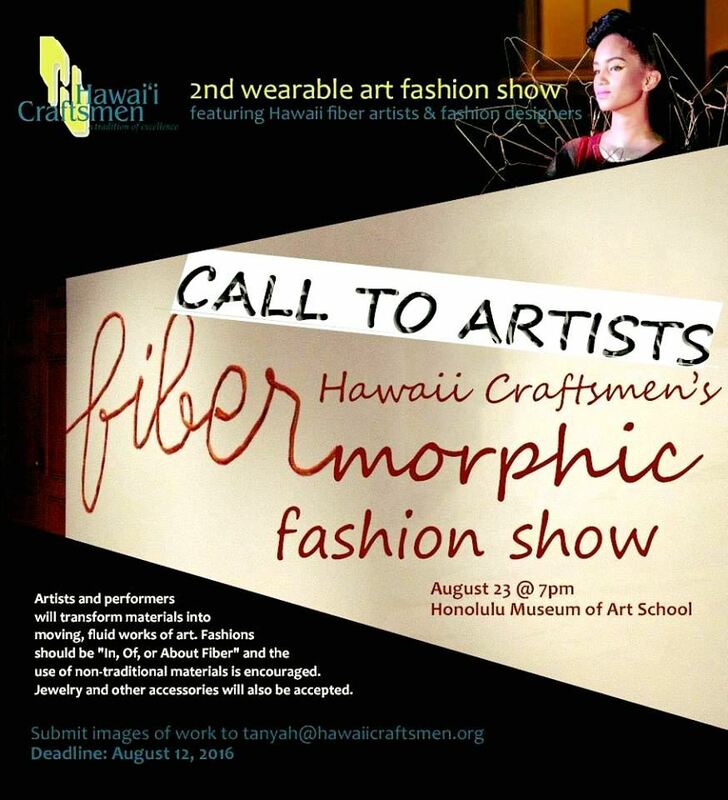 Programming for the evening will include ‘Fibermorphic Fashion Show’, the 2nd wearable art fashion show featuring Hawaii fiber artists and fashion designers. Show starts at 7:00 pm. This exhibit will feature works “in, of or about” fiber art. Entrants may use any media as long as it incorporates a fiber or textile technique or sensibility. Woven glass, clay or wire, handmade paper, traditional weaving, batik, and fabric painting are some possible techniques that would be eligible. Photography, traditional paintings or prints would generally not be acceptable. We are looking for artists and designers to create pieces as well as performers to model the creations. Models should have a background in dance and/or improv. Artists and performers will transform ordinary materials into moving, fluid works of art. Use of traditional store-bought fabric is discouraged, but do keep in mind they will be worn and performed in. 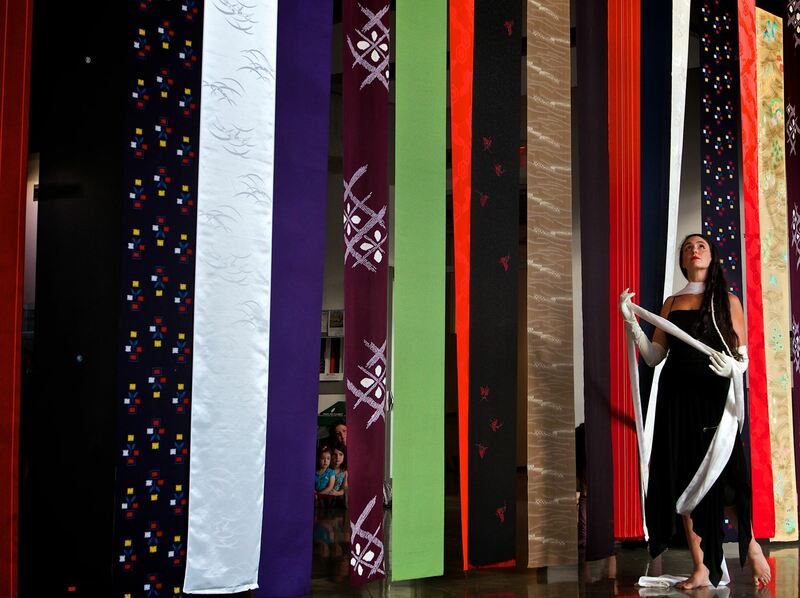 Show will be during the opening reception of our biennial Fiber Hawaii exhibition. 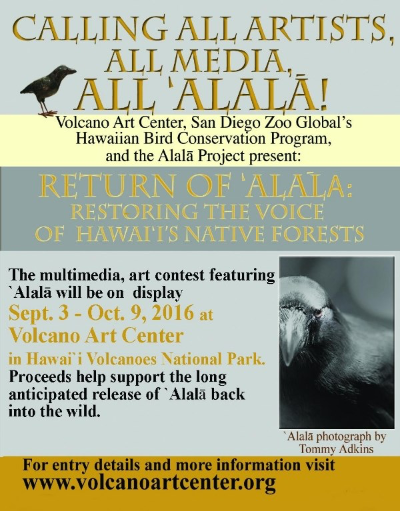 Email tanyah@hawaiicraftsmen.org if interested in participating. 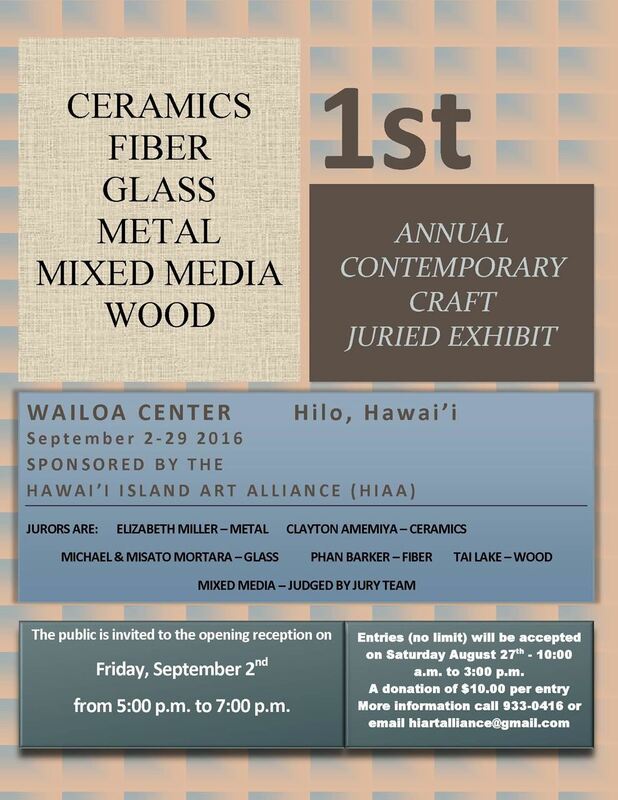 Hawai’i Craftsmen invites artist submissions to the 2016 annual exhibition of Hawai’iʻs finest craft arts. This yearʻs juror is Emily Zilber, Curator of Contemporary Decorative Arts at the Museum of Fine Arts, Boston. 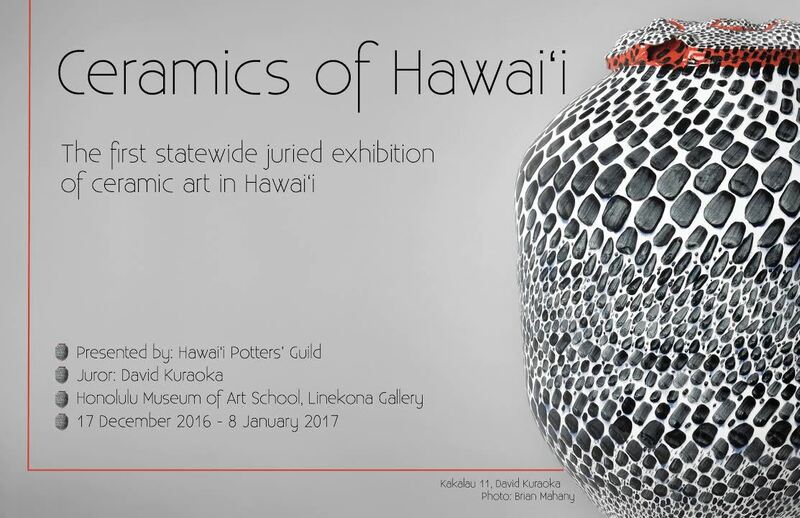 Opening reception and awards ceremony to be held at the Honolulu Museum of Art School on O‘ahu, Oct. 25, 5:30-7:30 pm. The newest exhibition at the Hawai‘i State Art Museum showcases kapa (Hawaiian barkcloth) and related works from the Art in Public Places Collection. 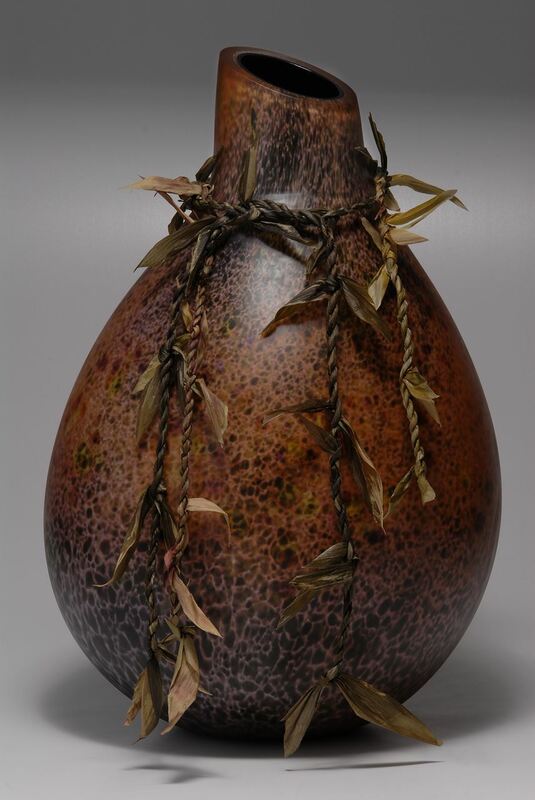 Ho‘omau: The Perpetuation of Kapa features 14 works by the following kapa practitioners and artists: Pam Barton, Kau‘i Chun, Pualani Lincoln Maielua, Philip Markwart, Juliette May Fraser, Marie McDonald, Lisa Schattenburg-Raymond, Dalani Tanahy, and Viliami Toluta‘u. You do not want to miss this exhibition! Explore the concept of "Voyaging"- going on a long journey in the spirit of exploration - as you view artwork by local artists in a variety of media. Experience the artists' interpretations of moving through space, transitioning, wandering, and passing from one place to the next. Visit the gallery to see his spectacular show for yourself! Visit facebook.com/hui.noeau to view featured artwork and artists throughout the exhibition, Including ASJE Invited Artist Derek Bencomo and Hawaii Craftsmen member Mary Ann Leigh. SECOND SATURDAY FESTIVITIES in Honolulu’s Downtown-Chinatown July 9th, 11 am to 4pm This Saturday, downtown/Chinatown kicks off its Second Saturday celebrations! Featuring these activities: • Summer Cinema Series at NextDoor • Psychic readings & culinary tours at Louis Pohl Gallery • Nu’uanu Ave & Bethel Street Sidewalk Sales (mauka of Pauahi Street) • Art Off the Wall Tours at the Hawaii State Art Museum Second Saturday is a daytime, family event dedicated to promoting the cultural, artistic and culinary richness of downtown Honolulu, from the Capitol District to historic Chinatown. Area museums, stores and entertainment venues will take turns presenting special activities to entertain on these dates. Saturday municipal parking is a $3.00 flat rate all day!!! 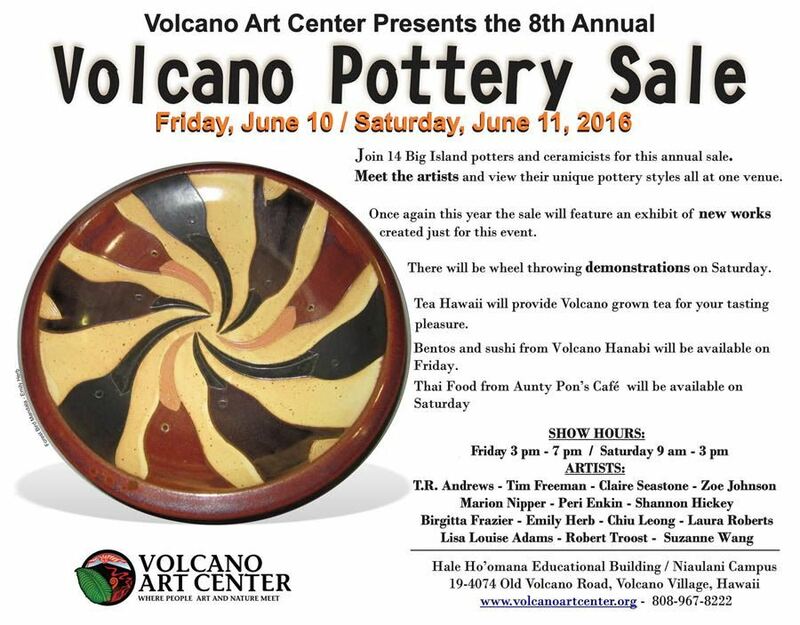 • Raku – selling tea bowls, t-shirts, silent auction, etc. PR and Promotional activities • Organize community displays of members work • Follow up press releases with phone calls and personal meetings. Check out photos from events and exhibits, see what your fellow craftsmen are up to, and get inspired. Click the "Like" button on our page to get our posts into your feed on facebook. Through the generous support of government, private foundations and individual donors, Hawai‘i Craftsmen has been able to continue to provide our community with successful programs. However, grants vary considerably from year to year and have recently been reduced significantly. Grants do not cover growing administrative costs such as rent, insurance and accounting expense or replacing aging office equipment such as computers and printers. Funding and cash flow remain the biggest challenges. We have a home in the Arts at Marks Garage but we must pay rent and our administrative costs, while moderate by industry standards, are increasing. Your involvement is vital to continue to make Hawai'i Craftsmen a success. We are increasingly dependent on individual contributions to improve member services and to cover basic office operations. Your contribution to Hawai‘i Craftsmen, in any amount, is critical to our future and tangibly recognizes the value of our programs. We welcome all contributions and suggestions for guaranteeing our future financial sustainability and more years of serving the Hawai'i art community. 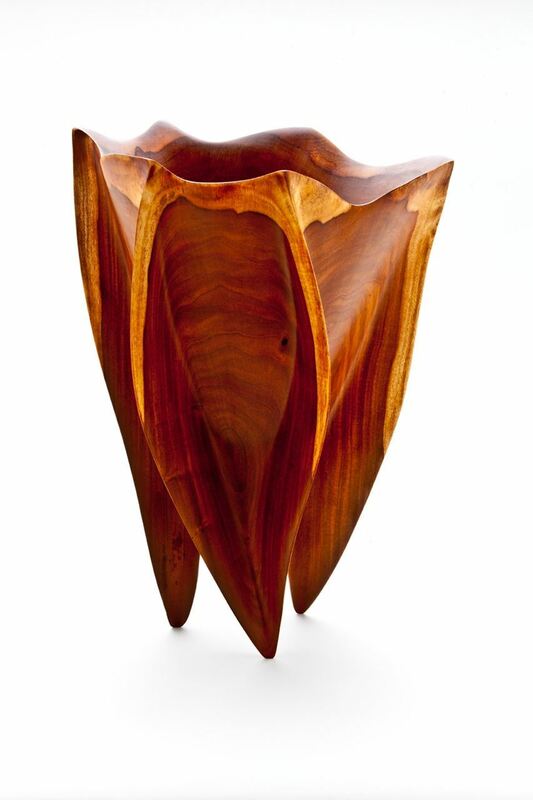 Hawaii Craftsmen is supported by the Hawai'i State Foundation on Culture and the Arts, the Hawaii Community Foundation, Atherton Family Foundation, the Cooke Foundation, the McInerny Foundation, several private family foundations and you, our members.